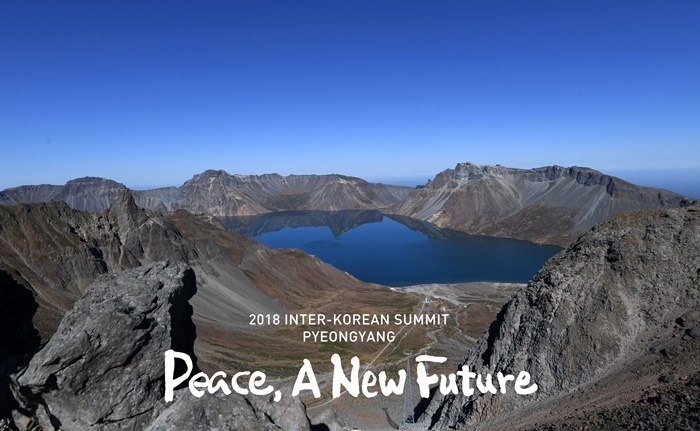 So said President Moon Jae-in as he reached Janggun Peak, the highest spot atop Baekdusan Mountain, the highest mountain on the Korean Peninsula, alongside first lady Kim Jung-sook and the North Korean first couple on Sept. 20. Here, they could look down on the famous Cheonji Lake that sits at the top of the mountain. 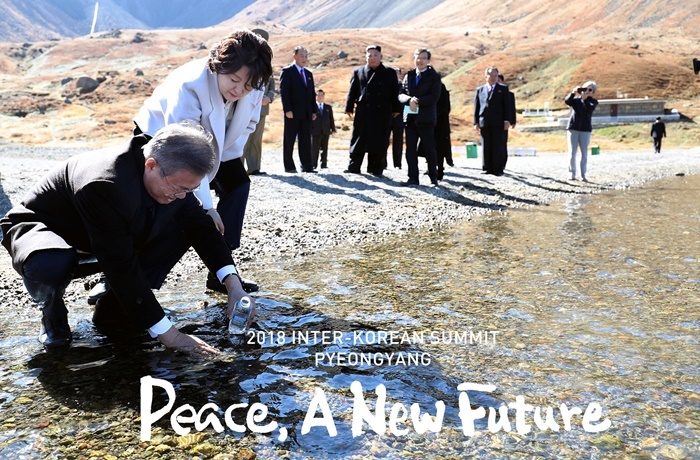 The president and the first lady left the Beakhwawon state guesthouse, where they stayed during their visit to Pyeongyang, in the early morning and arrived at the Samjiyon Airport located near the mountain at 8:20 a.m. and joined Chairman Kim and North Korea’s first lady Ri Sol Ju there. The two first couples moved to Janggun Peak by car and had some friendly chitchat while looking at Cheonji Lake. They briefly dropped by Hyangdo Station, at which a train to the mountain stops, and then moved on to the lake via a gondola at 10:20 a.m. 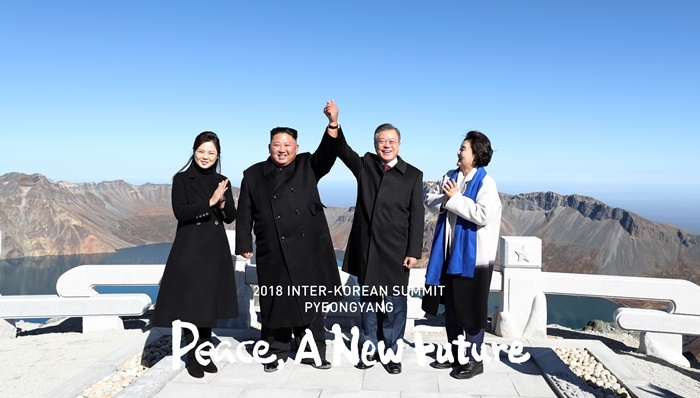 The first couples of the two Koreas visited Cheonji Lake on the top of Baekdusan Mountain together on the third day of President Moon Jae-in’s trip to North Korea on Sept. 20. Chairman Kim described Janggun Peak as the best spot from which to appreciate Cheonji Lake, and suggested they take a group photo. President Moon then said, “Here, Chairman Kim and I should raise our hands together.“ The two Korean leaders held their hands up high with a huge smile beaming across their faces. The first ladies also engaged in conversation while at the mountain. 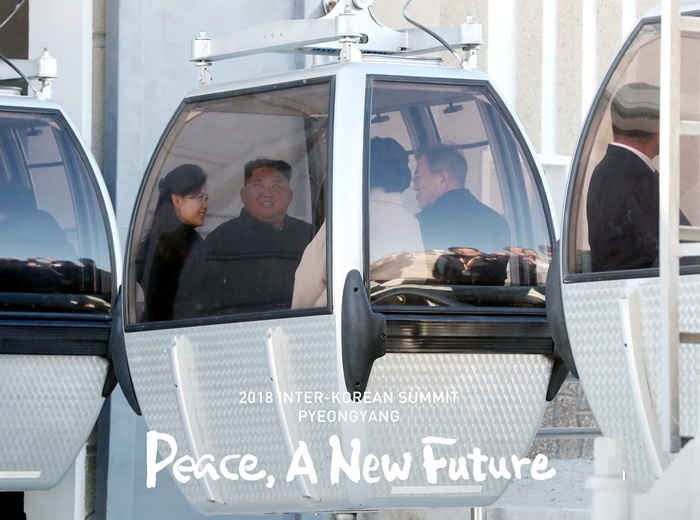 “There’s an old saying in our country that the sunrise is seen from Baekdusan Mountain and that unification is greeted at Hallasan Mountain,” said Ri. The first couples of the two Korea ride a gondola from Janggun Peak down to Cheonji Lake at Beakdusan Mountain on Sept. 20.